Muskegon, Michigan, USA...As the number of robot installations continues to grow, more designers than ever are specifying Kaydon Reali-Slim® thin section bearings. Reali-Slim bearings save weight, letting robots maximize payload and reduce inertia. Their compact size helps designers meet stringent space requirements. 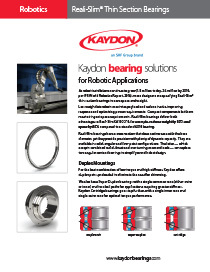 Download the new robotic application case study to learn more about Kaydon Reali-Slim® bearing mounting options and how these bearings carry relatively high loads even in very confined spaces. Reali-Slim® thin section bearings provide solutions for a variety of robotic applications, including industrial (painting, welding, handling); medical (surgery, artificial limbs); semiconductor (pick-and-place); oil and gas (iron roughnecks); and aerospace (UAVs, UGVs, Mars rovers).